With regular connections from Montenegro to southern Italy, all offered by Montenegro Lines, Bar is a fantastic way to save a long journey across land. AFerry offers you an easy way to save money on your tickets with ferries from Bar. Montenegro Lines ships are fully equipped vessels offering a wide range of facilities on board including quality cabins and airline style seats, spacious lounges and restaurants serving local delicacies and international cuisine whether you fancy a full meal or just a snack. Bar is on the coast of the small country of Montenegro. From here you can get a ferry to the south of Italy, cutting out several hundred miles of travel across land. You can find the lowest offers on these ferries with AFerry. The old town and the fortress are well worth a visit, dating back several hundred years. There are regular buses from along the whole coast to Bar. There are also various night and day train services from many cities in Montenegro to Bar, from where you can get a connecting bus to the port. The port is well connected by rail and road, with direct rail access to Belgrade. 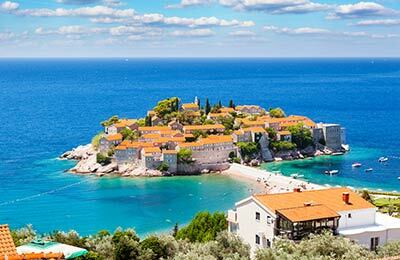 Bar is a coastal town and port in southern Montenegro. The town is not very big with about 18,000 residents but there are plenty of things to see and do including the old town of Bar, Haj Nehaj Fortress and the castle of King Nikola. And of course Bar features wonderful beaches with crystal clear water - typical of the region. If planning to stay for a few days or more you will find plenty of options in terms of hotels and guest rooms as well as restaurants and bars.